Totally professional from start to finish. On time, very clean and tidy. Work area kept immaculate. Work carried out quickly and to an excellent standard. Very polite and friendly. Dave Rees visited us and gave us a quote a couple of weeks ago and visited today to fit a new loft hatch, loft ladder, loft boarding, loft light and insulation. We could not be happier with the service, Dave is a lovely guy. Very friendly and approachable. The quality of the fitting and service is superb. Professional and high quality. We will recommend to anyone. What an excellent service! From the initial phone enquiry through site visit, quotation, fitting in with our dates preferences and the work itself. Everything has been excellent. Dave is so helpful and accommodating. Excellent job. Makes loft easily accessible. No mess, clean and tidy. Would recommend Access4lofts to anyone. We are glad to recommend Access4lofts. The work was undertaken as promised in the explanation given by Dave. He worked the whole time he was in the home. The work was carried out as indicated and the property was left tidy and all cleared of any bits and pieces. Great care was taken to ensure that the premises were respected. Dave visited the premesis, gave a full explenation of the loft ladder and loft hatch and how it was going to be installed. I was happy with the price and the jo was cmpleted within one week. A very professional company. The loft access was fitted with the half day and I am very pleased with the result. Fantastic professional service, Friendly, tidy and efficient. Outstanding result! We couldn’t be happier with the work Dave carried out and will be thoroughly recommending. Our loft ladder was fitted by Dave. He was very pleasant and courteous. The ladder was fitted without mess or fuss. It works excellently. I would recommend Dave and Access4lofts. Quick and easy installation. Friendly and tidy tradesman. Very happy with the result. Wish I had it done years ago. Excellent work Dave. I am pleased with the finish. Very professional service and all clean and tidy. Would recommend this young man to anyone. So helpful and polite. The work was excellent He was spot on time, no mess and very little noise. Delighted with the new loft ladder and hatch. Has made access to the loft very easy indeed. Job started exactly on time and completed efficiently and quickly. Dave was friendly, polite and very knowledgeable. My house was left spotless. Highly recommended. Thank you Dave, for a very professional job. It was nice to see in this day and age somebody actually turn up when they say they are going to. The finish was very good. Excellent job by Access4lofts. Provided valuable storage space and made access simple with a good quality extendable ladder. Good price, very clean and tidy. Thoroughly recommend. Service from this company has been exemplary from initial enquiry To execution of work. Appointments were made and kept on time. Wok was carried out efficiently without disruption and delivered in a polite and courteous manner. Highly recommend. We had Dave around to fit a new loft hatch, board and insulate our loft. We truly couldn’t be happier with the work. Dave came around to quote and the job was exactly as quoted – no hidden cost. Dave was a clean worker and there was no need to tidy up afterwards. really couldn’t recommend enough. shame he just does lofts, my mum would have him doing all of our odd jobs. Thanks again. What a great service. Arrived when stated, no mess and really pleased with my loft boarding and shelving. Very robust, Dave even re-positioned my loft ladder to make it more secure for no extra cost. Would definitely recommend your service. Thank you. Very prompt and efficient service. Everything about the material used to insulate the loft was explained. I will definitely ask Dave to come back when we get round to wanting a ladder and floor boards in the loft space. Dave arrived on time as agreed and installed the loft hatch and loft ladder in a professional and competent manner. He gave a good demonstration on how it all worked and left the work area really clean. We would certainly recommend him. Today we had a new loft ladder and loft hatch fitted. We are very pleased with the work carried out. Great care was taken to ensure it was done without any mess and a professional finish accomplished. We would be happy to use Access4lofts in the future. excellent service from initial contact to completion of installation. Dave was very polite, friendly and explained in detail the work hat was being carried out. He was punctual on the day of the work and took great care with the task in hand. When he had completed the work, he left the place clean and tidy. I would have no hesitation in recommending access4lofts. 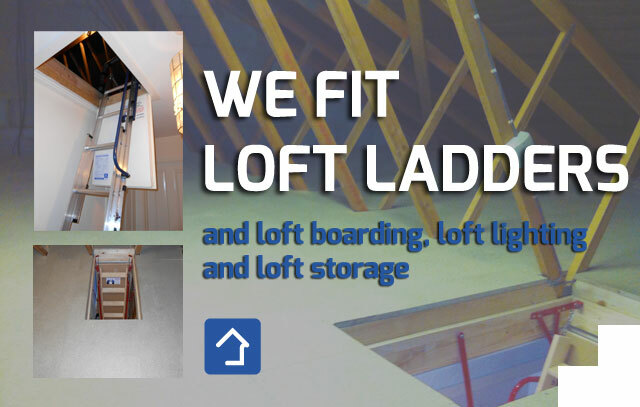 We were delighted with our new loft ladder and would definitely recommend Access 4 Lofts. The Installation was quick with no mess to clear up afterwards. many thanks for a great job by a friendly and polite fitter, Dave. A1 again! We moved house and had Access4lofts back to install a new loft ladder and hatch in our new house. We will se you again when we next move! Thoroughly professional job from start to finish. punctual, courteous, clean and efficient. Very impressed. Would certainly recommend. Thanks very much for a great job! Nice to deal with a straight forward tradesman who turns up on time and works so well. Dave gave a clear explanation of use. Brilliant service, Dave responded to my email within two hours, came to price up the job that same day and came to fit the ladder within a week of the initial enquiry. Dave was pleasant, professional and efficient throughout. He arrived to fit it when he said he would (and on time) and finished quickly doing a great job, leaving no mess. I cover the areas of Plymouth, Tavistock, Saltash, Yelverton, Ivybridge and the surrounding areas. I offer a free quotation service with no high pressure sales and better still I don’t blind you with science or give you an approximate price and then add on extras – all my quotes are followed up in writing the very next day and I put a minimum of 5 year guarantee on all my work! I’m also accredited by the Which? Trusted Trader Scheme.